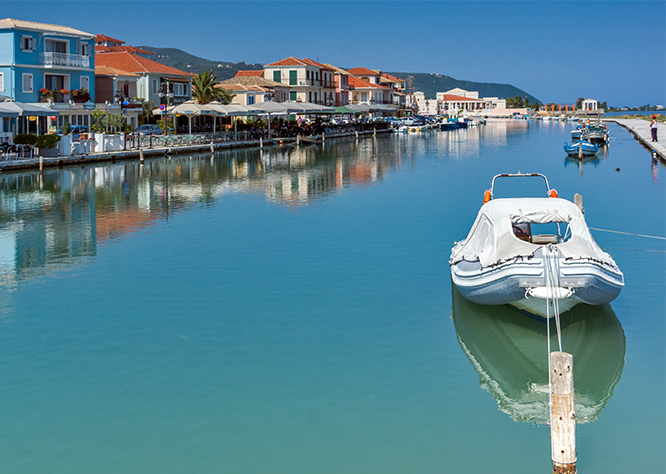 Lefkada offers much to explore. 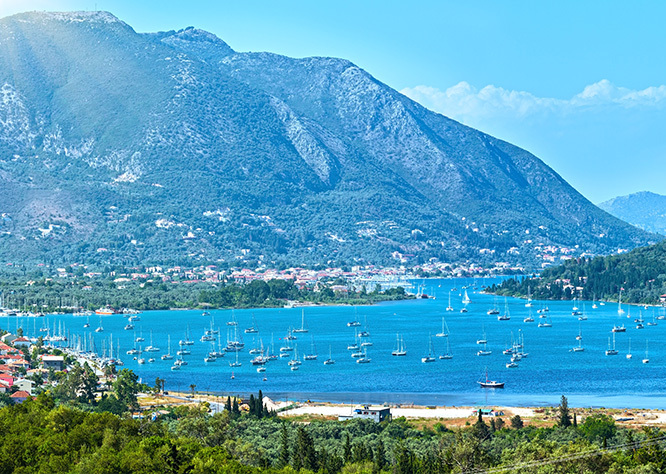 The eEast coast, where Villa Lemoni is situated, is the most picturesque side of the island and is very popular with sailors due to its calm waters and pretty islands with their many coves and harbours to stop at and enjoy lunch or dinner. The west coast is more rugged and windswept, offering a more dramatic coastline, fantastically blue waters and amazing beaches. Some are relatively inaccessible requiring a walk from the car, which instantly means fewer people. For the adventurous, these are a must. Only a five-minute drive from the villa, this long white sandy beach has restaurants, hotels, nice views of islands off shore and usually plenty of people. Children will enjoy the shallow water and there are water sport facilities for water skiing, jet skiing, wakeboarding and parasailing. Big rock formations add to the texture of this white beach about one hour from the villa. Waves beating among the formations make the views and swimming especially interesting. A challenging drive keeps the crowds down and there is a cantina with sunbeds and umbrellas to reward you. 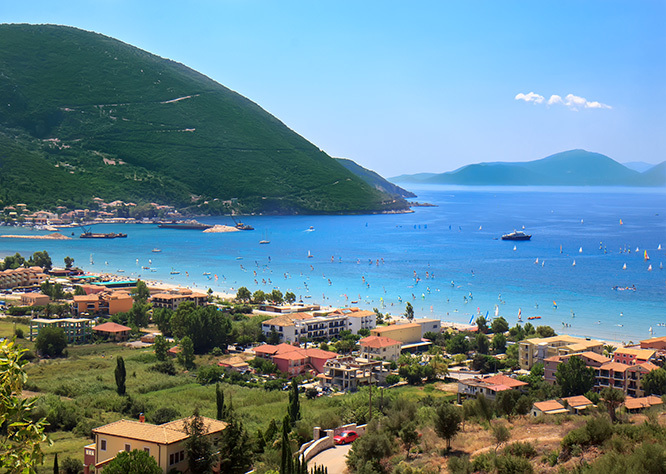 A spectacular panorama near the town of Vassiliki and inaccessible by car. 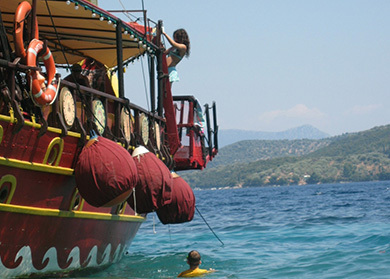 Hike or taxi-boat from Vassiliki to this more secluded spot. Bring your own supplies and good shoes since the rocks are a bit bigger here, a small price for a gorgeous beach, clear aqua water and no roar of the crowd. 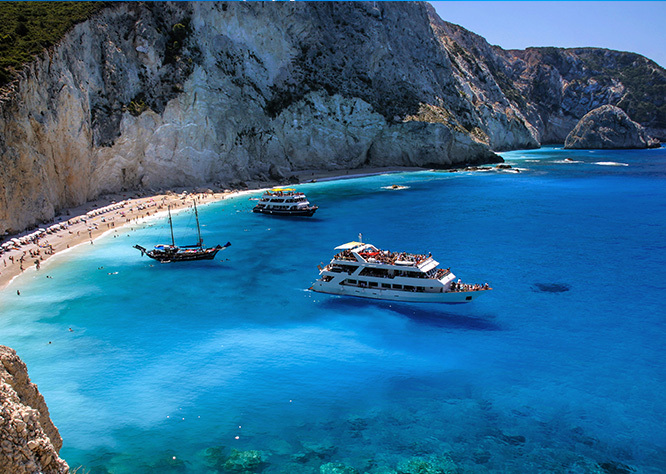 The most famous beach in Lefkada boasts unthinkably crystal blue water against a backdrop of dramatic white cliffs. 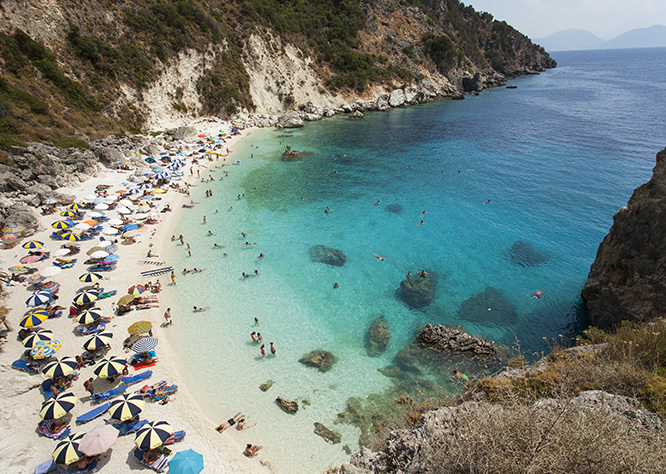 It’s been named a top 10 beach with the clearest water in the world. This breathtaking sand and pebbled beach is known as one of the most gorgeous in the Mediterranean. 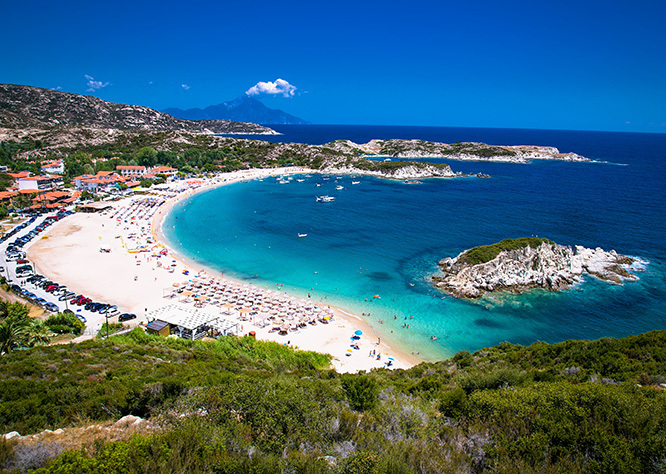 Drive about 45 minutes from the villa and take the stairs down or go by taxi-boat from the villages of Vassiliki and Nidri. There are snack shops up top and shade on the beach from rented sunbeds and umbrellas or find your own nook in the foliage-topped limestone cliffs. 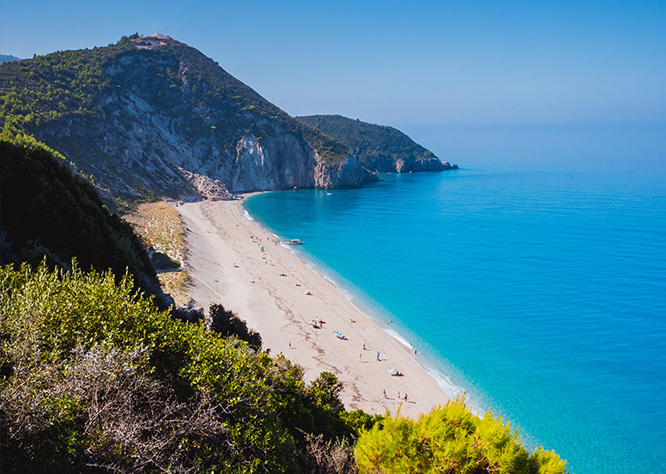 This is one of the longest beaches of Lefkada with fine white sand and pebbles, turquoise waters and a lively beach scene. A young crowd at the north end of the beach may be boisterous while someone seeking to be lulled by the often high surf might find a better spot at the south end, but at peak times don’t count on it. You can drive right up, there is food and drink for sale and it’s about three kilometers beyond the village of Agios Nikitas. Sunbeds, umbrellas and maybe even sky parachute available here. 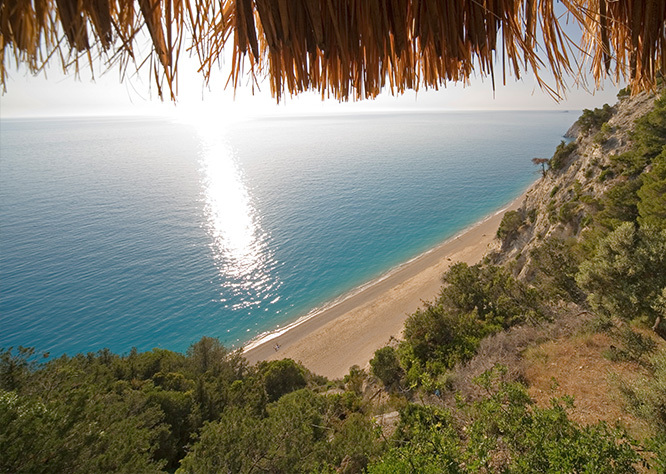 This has long been an unspoiled beach landscape just south of the village of Agios Nikitas. Less populated, it’s good for the sunbather or swimmer who seeks some privacy. Though a road is planned, best ways to get there is a hearty trek from the village or by taxi-boat in July and August from the Agios Nikitas town beach. Bring your own food and drink since this is not a commercial spot, it’s just a beautiful spot. Until an earthquake submerged the beach in November 2015, this was probably the second loveliest beach on the island after Porto Katsiki. The more than 300 steps down to the stunning contrast of deep blue water and framing limestone cliffs was always worth it and is expected to be again as the beach is rebuilt. 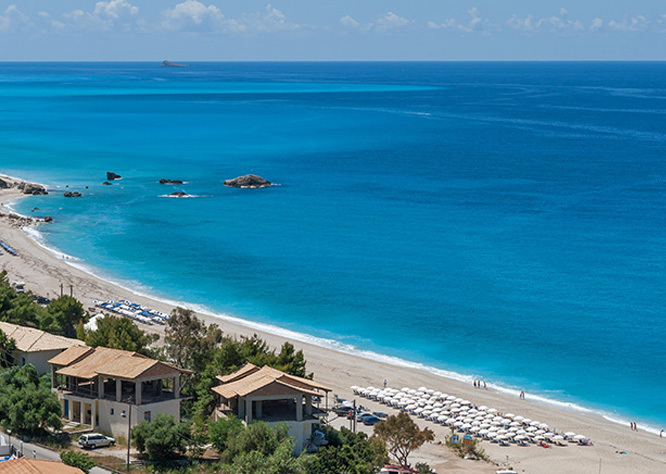 5 mins drive, is the primary holiday resort on Lefkas. There are a variety of tavernas, restaurants and cafes here, also a handful of bars and a couple of nightclubs. The majority of shopping and tourist facilities are on the main street. 20 mins drive, is the main commercial centre. There is a quayside road south of the causeway entrance with a busy marina. The High Street runs through the centre of town and is also known as the “Pazari”, this is the main street for shopping and cafes. A mid-morning coffee in the square is ideal for a break and a perfect opportunity to see the Lefkadians in “action”! The architecture has been mainly influenced by the Venetians and the post Byzantine traditions but also by the Turkish and the English. The houses in the main part of the town are two story buildings, very closely packed, without yards or gardens and with narrow alleyways running between them. 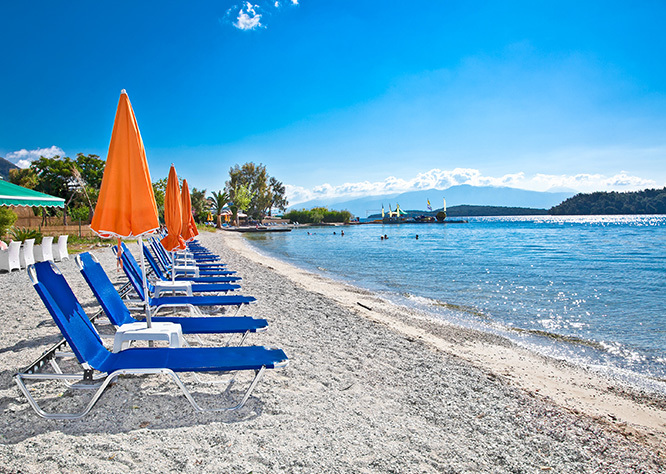 This is the town beach in the quaint village of Agios Nikitas. You can swim here or have a meal on Main Street looking at the blue waves, jutting rough rocks and fishing boats. 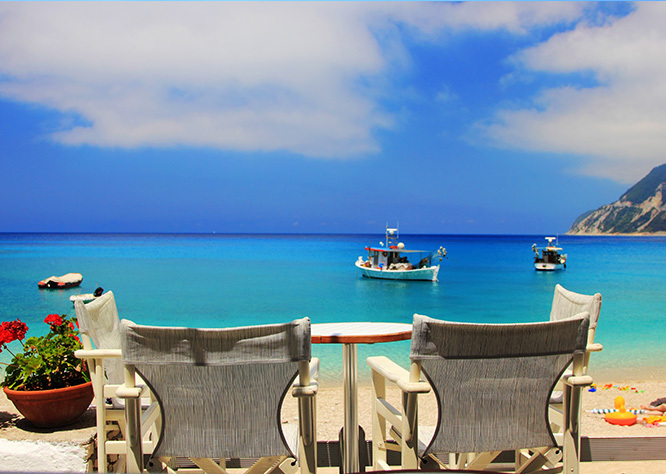 From here you can catch a taxi-boat to the more isolated Milos or Pefkoulia beaches. Here in windsurfing heaven, take a morning lesson or just watch the afternoon windsailing rush hour. It’s about a 25-minute drive from the villa to this self-contained tourist beach resort with a range of cafes, shops and windsurf board rentals. The beach is sand and pebbles with a thermal wind in the summer. This is a must! The tour operator who owns this boat is a character. The boat is docked in the harbor in Nidri. You will very much enjoy the excursion. It leaves at 8:30 a.m. and you will need to buy tickets at least one day in advance. Helen can arrange this for you. The boat is docked in the evening in Nidri. You can buy tickets then. A delicious lunch is provided with the tour. The excursion lasts most of the day and goes to interesting spots including Skorpios, the island owned by the Aristotle Onassis family. You will return around 5:00 p.m.
You must visit the Fragoulis Distillery in Lefkada Town, but more importantly you must drink their superb ouzo. Far superior to the national brands, this anise-flavored delight is a must for your every toast on this gloriously beautiful island. Ice cream as memorable as the island. 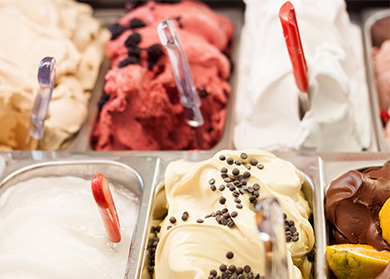 The owner makes this ice cream herself, different flavors every day, and it is by far the best in Lefkada Town. You are on vacation; it is imperative you check in often for what even some connoisseurs have said beats the competition in Italy. This restaurant is located in the town of Sivota. This is a beautiful place to have dinner with an ocean view. It is located in a natural U-shaped harbor with restaurants lining all of the boat slips in the harbor. This restaurant is probably the best in that town. It is about 20-30 minutes from the Villa, but is most certainly worth the drive. 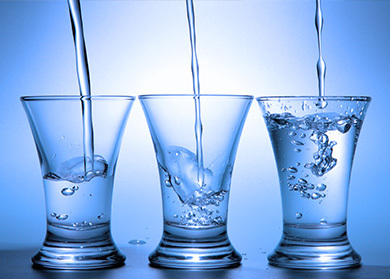 When you arrive, be sure to ask for a table located next to the water. Although the restaurants here open early, the dinner hour does not really begin until 9:00 p.m. The menu is mainly the fresh seafood catch of the day. Some meat and vegetarian dishes are offered as well, along with “home-brewed” wine served in pitchers and drunk from small juice glasses. Traditional Greek food on tables lining a quiet street off the main drag in Lefkada town. You may be allowed to visit the kitchen to decide what to eat. Casual, family place with fresh seafood, mouthwatering moussaka, papoutsakia, and stuffed zucchini. Everything is superb. Like home cooking, if you lived in this beautiful place. Very friendly, and known for its delicious meat dishes. Located near Villa Lemoni in Vlycho, it is also a butcher shop, so you will get the best cuts of meat. The food has such an awesome reputation that the Russian heiress who bought Aristotle Onassis’ private island Skorpios commissioned this restaurant’s owner Pavlo to come cook for a party.